NASA?s MarsReconnaissance Orbiter has unexpectedly rebooted its main computer and entereda protective safe mode after being hit by stray cosmic ray or solar particle aswhile circling the red planet. The event occurredWednesday night at 9:10 p.m. EDT (0110 June 4 GMT) and appears similar to aglitch that stalled the powerful Marsorbiter?s science work in February, mission managers said. ?The flightteam is cautiously bringing the orbiter back to normal operations,? orbiterproject manager Jim Erickson at NASA?s Jet Propulsion Laboratory in Pasadena,Calif., said in a statement released Thursday. ?We should be resuming our exploration of Mars bynext week." Ericksonsaid flight controllers are in contact with the beleaguered Mars ReconnaissanceOrbiter, which is beaming home data and is otherwise in good shape. The orbiterhas entered the so-called safe mode six times since it launched toward Mars in2005. The mode is a safety precaution that allows the spacecraft to hunker downand await instructions from Earth when it detects a condition that it does nothave a specific response for, mission managers said. The MarsReconnaissance Orbiter last entered safe mode on Feb. 23, when it detected apower spike that ultimately turned out to be a false reading. Engineers later determinedthat the erroneoussignal was most likely caused by a cosmic ray or solar particle hitting theorbiter?s sensitive electronics. A similar eventis suspected in this week?s malfunction, mission managers said. The $720million Mars Reconnaissance Orbiter arrived at the red planet in October 2006and successfully completed its initial two-year mission in 2008. 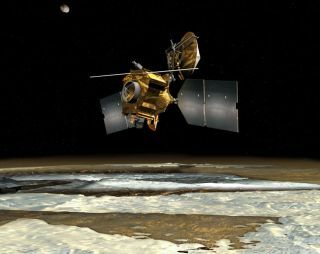 The probe?s Marssurvey has since been extended through at least 2010. The MarsReconnaissance Orbiter is not the only ailing spacecraft currently at the redplanet. Down on the planet?s surface, NASA?s Marsrover Spirit is stuck up to its hubcaps after snaring its six wheels indeep Martian sand. The rover recentlyused a camera on its robotic arm to take a snapshotof its belly so engineers can get a better look at its sandy quagmire. Engineersare hopeful they can free the long-lived Spirit rover so that it can continueits exploration of a region on Mars that scientists have dubbed ?Home Plate.? Spirit andits robotic twin Opportunity, which is working fine and recently passed the10-mile mark in its own Martiantravels, have been exploring the red planet since 2004.